Job costing accounting or job order costing is a costing method in which costs are accumulated and analysed by individual jobs or orders. The purpose of the job costing system is to accumulate the costs relating to a particular job. On completion the business knowing the total cost and selling price can then determine the profitability of the job. The job order cost method can be used in both manufacturing and service businesses and is best suited to industries in which small jobs are undertaken with each job having its own characteristics. For example, a consultancy business might engage in a number of different jobs for a particular client in which case the costs associated with each job are accumulated separately, or a manufacturing business might produce a bespoke product for a customer. Job costing has a number of unique characteristics. The job or order is the unit of production. Each job has its own specific characteristics and are often for a particular customer. Direct costs such as raw materials and labor are allocated directly to the job or order. Indirect costs are applied to the job using an appropriate predetermined overhead rate. Jobs are normally small and completed in a short period of time. Larger jobs such as a construction project which remains incomplete at the end of an accounting period, use the contract costing method. 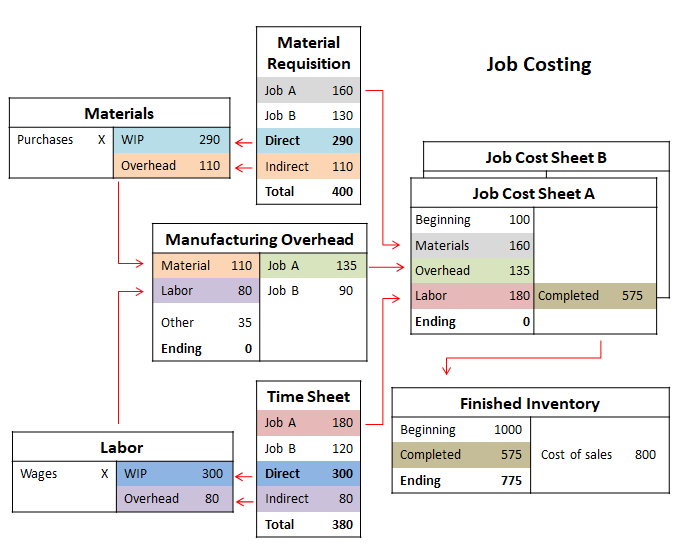 Job costing can be applied to manufacturing and non-manufacturing operations. Job costing accounting involves transferring costs from the raw materials, labor and manufacturing overhead accounts to a work in process (WIP) account. Each job has its own work in process account usually referred to as a job cost sheet to accumulate its respective costs. Costs are transferred to the work in process account using the following accounting source documents. The materials requisition form is used to issue materials either directly to a job (direct materials) or to manufacturing overheads (indirect materials). The transfer takes place by a credit entry to raw materials and a debit entry to either the job cost sheet or to manufacturing overhead. The job timesheet is used to transfer labor costs either directly to a job (direct labor) or to manufacturing overheads (indirect labor). The transfer takes place by a credit entry to labor costs and a debit entry to the job cost sheet or to manufacturing overheads. Manufacturing overhead is accumulated in the manufacturing overhead account and comprises indirect materials from the material requisition form, indirect labor from the job timesheet and other manufacturing overhead such as expenses and depreciation supported by the appropriate source document. Manufacturing overhead is applied to jobs using predetermined overhead rate calculated on an appropriate basis such as direct labor hours or labor cost. The transfer entry is a credit to manufacturing overhead and a debit entry to the job cost sheet. When combined, the collection of individual job cost sheets form a subsidiary ledger referred to as the work in process (WIP) ledger. As with other subsidiary ledgers the business can choose whether this ledger or the work in process control account in the general ledger is part of the double entry bookkeeping system. The totals of all transfers in and out of the job cost sheets in the WIP ledger are also posted to the WIP control account in the general ledger. At the end of an accounting period the balance on the WIP control account should equal the sum of the balances on each of the job cost sheets in the WIP ledger. Finally, on completion the total costs of a job are transferred from its job cost sheet in the WIP ledger to the finished goods inventory account. On sale the costs are then transferred from the finished goods inventory account to the cost of sales account in the usual manner. Our post on job order costing bookkeeping journals provides further details of the accounting entries referred to above. The diagram below sets out a summary of the job costing accounting system and identifies the cost transfers in relation to Job A. Throughout this example reference should be made to the diagram above. A business has two job orders A and B. Job A: At the start of the accounting period Job A has accumulated costs brought forward of 100. The material requisition forms shows direct materials issued to the job of 160 and the timesheets show the cost of direct labor used on the job is 180. The job is completed during the period. Job B: Job B is started during the accounting period and the material requisition forms shows direct materials issued to the job of 130 and the timesheets show the cost of direct labor used on the job is 120. The job is not completed at the end of the accounting period. Manufacturing Overhead: The material requisition forms show indirect materials of 110 issued into production and the timesheets show indirect labor of 80 used in production. In addition source documents show other manufacturing overheads of 35 for the accounting period. The business applies overhead to the jobs on the basis of total direct labor cost. The information is summarized in the table below. The first step is to calculate the overhead to be applied to each job. The overhead is then applied at this rate to each job based on its direct labor cost. The direct materials, direct labor, and applied overhead are now posted to the job cost sheets in the WIP ledger as debit entries. The corresponding credit entries will be to the raw materials, labor, and manufacturing overhead accounts. Since Job A is completed by the end of the accounting period an additional transfer is made from the WIP ledger to the finished goods inventory account. See our job order costing accounting journal entries for further details. After the transfers have been made the job costs sheets in the WIP ledger will appear as follows. The job cost sheet for Job A shows a beginning balance of accumulated costs brought down of 100. To this are added direct materials 160, direct labor 180, and manufacturing overheads of 135. When the job is completed the total costs amount to 575 and these are transferred from the job cost sheet to the finished goods inventory account leaving a balance of zero on the WIP ledger for Job A. The cost sheet for Job B shows that the job was started during the accounting period and that direct materials 130, direct labor 120, and manufacturing overheads of 90 have been transferred to the job. At the end of the accounting period the job is not completed and the total accumulated costs of 340 are brought down to the next period on the WIP ledger. The balance on the WIP ledger should be the same as that in the WIP control account in the general ledger. For further information relating to the double entry postings see our post on job order costing journal entries. It should be noted that job costing and process costing are two different methods of costing. The main difference between job costing and process costing is that job costing is used when the costs can be analysed to a specific job or order, whereas process costing is used when costs are analysed by stages in a manufacturing process. The choice depends on the type of industry involved. For example a chemical processing plant might use process costing in which costs are analysed for each stage in the production process whereas a consultancy firm might use job costing in which costs are analysed for specific jobs for a particular customer.